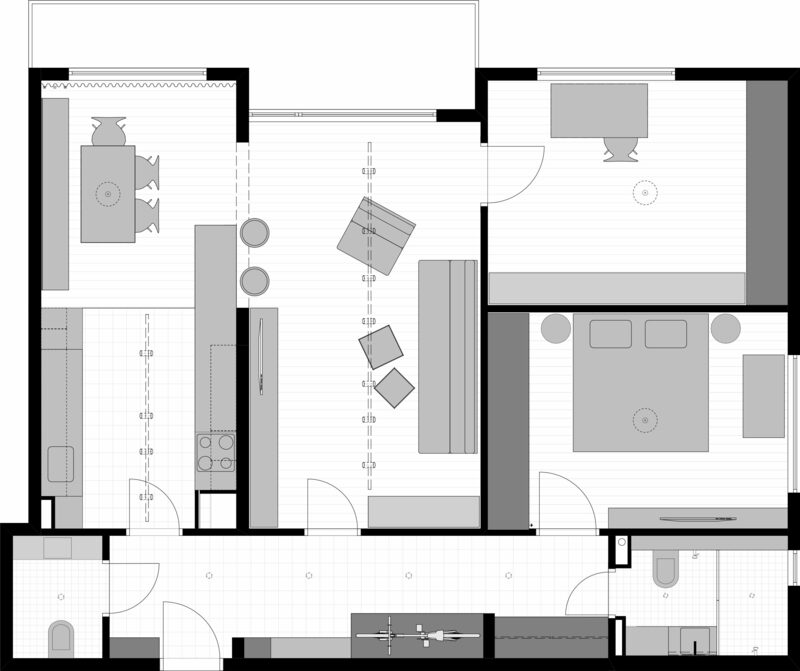 Partial Interior design of an apartment for a young family and their newborn daughter. The main challenge constituted in finding more closed storage spaces. The latter is achieved by optimizing the foyer and kitchen area mainly. The new built-in furniture in the entrance and corridor area contains all essential large appliances and other possessions of the family including a boiler, vacuum cleaner, suitcases, bicycles, clothes, shoes and small objects like keys, coins etc. This large piece of furniture transforms in a bench with hangers next to the entrance. The work surface and storage spaces in the kitchen are also optimized and extended. The kitchen top extends in the form of a lunch counter into the dining and living areas of the apartment enhancing them with new functions.